The two top Democrats in Congress on Thursday called on House Speaker Paul Ryan to remove Devin Nunes as chair of the House Intelligence Committee, painting Nunes' push to release a controversial classified memo as an abuse of his position that amounts to carrying water for the White House. "The decision of Chairman Nunes and House Republicans to release a bogus memo has taken the GOP’s cover-up campaign to a new, completely unacceptable extreme," House Democratic Leader Nancy Pelosi, D-Calif., wrote in a letter to Ryan. "From the start, Congressman Nunes has disgraced the House Intelligence Committee," she added. "Since pledging to recuse himself from the Trump-Russia investigation, Congressman Nunes has abused his position to launch a highly unethical and dangerous cover-up campaign for the White House." Senate Minority Leader Chuck Schumer, D-N.Y., released his own statement urging Ryan to remove Nunes, saying the memo is meant to "sow conspiracy theories and attack the integrity of federal law enforcement as a means to protect President Trump." Ryan responded Thursday afternoon, accusing the lawmakers of playing a "political game." "This memo is not [an] indictment of the FBI, the Department of Justice," he said. "It does not impugn the Mueller investigation or the Deputy Attorney General," Rod Rosenstein. "I think they’re just playing politics and I think they’re looking for a political distraction is what I get out of that," he added. "I think what they’re trying to do is just sidetrack us with some political game." 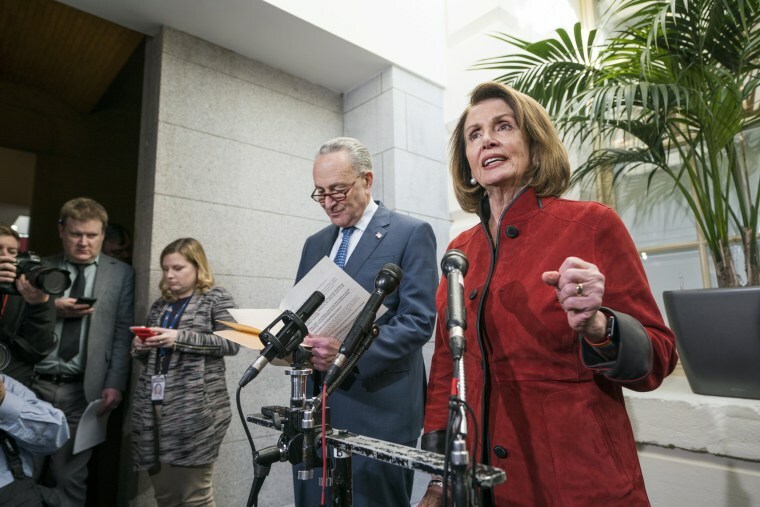 Pelosi and Schumer are the most prominent Democrats to call for Nunes' removal after the House Intelligence Committee voted along party lines Monday to make public a classified memo written by Nunes' office about some of the government's most sensitive secrets. Republican lawmakers have said the GOP-written memo shows corruption in the FBI that is "worse than Watergate," proving that special counsel Robert Mueller's investigation is based on a fraud. Democrats have called it a grossly distorted attack on the Mueller probe, which is investigating Trump's campaign for possible collusion with Russia. The memo is currently under White House review and the final decision on whether to make it public rests with Trump. The FBI and the Department of Justice have strongly objected to the release of the memo. However, Rep. Adam Schiff of California, the House Intelligence Committee's ranking Democrat, said Wednesday night that the committee had sent the White House a different version of a classified memo about the Trump-Russia investigation from the one that committee Republicans voted to release to the public. Jack Langer, a spokesman for Nunes, confirmed that the memo had been edited, but said that the changes included "grammatical fixes and two edits requested by the FBI and by the Minority themselves," referring to committee Democrats. Schiff also said Thursday that Nunes should step down. "I mean, he said that he was going to step aside or recuse himself, but never really did," Schiff said at an event at The University of Pennsylvania Thursday, referring to Nunes's earlier decision to recuse himself from the House Russia probe. "Throughout this whole time, he continued to make the most consequential decisions in our investigation." "So should he step aside? Yes. He sort of said he was gonna do that already but really didn’t and I think we need someone credible leading the investigation," he added. Nunes "stepped away" from the House Russia investigation in April after an ethics complaint was filed. But he later said that was not a formal recusal. Multiple White House officials told NBC News that Trump has read the FISA memo, as delivered to the White House. The White House has agreed to some redactions in the memo at the FBI's request, multiple White House officials confirmed. But the officials reiterated that no final decision had been made yet on whether to approve the memo's release.